Last year, my family decided to go on a vacation for about two weeks when the average temperatures here in Idaho were over 100°. We came back to find that half of our backyard had died because nothing was watered the whole time we were on vacation. This year, it took me a lot of work to get my lawn back into shape, and I decided that I didn't want the same thing to happen again. The first thing I did was to install backyard sprinklers. If you've been putting off installing your own sprinkler system because you thought it was going to be too expensive, I can show you how to do it for a lot less money. 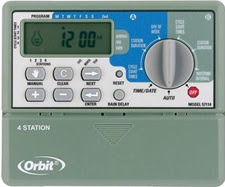 The first thing you need to do is you need to choose a sprinkler timer that you can install with your outdoor faucet. This is easy because you do not require any additional plumbing, and because it is cheap and easy to install. Now, if you put in a more expensive sprinkler system, you're going to have your sprinkler timer in your garage, or on the side of your house. You may have to hire an expert to do the wiring for you, because it is pretty complicated and you need to make sure to have it all done correctly. However, when you are using a battery operated sprinkler timer, you can put it directly onto your outdoor faucet. These types of timers work with one or two stations. If you have a large backyard, you will want to use one that has two stations. In addition, you'll probably want to also use a splitter so that you can still use your hose. Put the splitter on the end of your faucet, and then attach the battery powered sprinkler timer onto that. Next, you're going to want to use an adapter so that you can connect the timer to your underground sprinkler system. When you are installing your sprinkler, you can either buy two or three dollar heads and install ten of them, or you can pay $15 for your sprinkler heads and only install two or three. If you have an odd shape lawn, you may need to install the smaller sprinklers in order to reach everything. Most of the time, you can use the larger heads and they work just fine. I like to use a larger head because it means I don't have to dig nearly as much trench in my lawn. My back lawn is about 1,500 ft.². This is not that much area to cover. I only had to dig two lines and install two sprinklers. Before installing them, I had to test my water pressure to make sure I had enough pressure for both heads. You can buy a water pressure gauge, or you can just turn your water on full blast, and time how long it takes you to fill up a bucket. If you have decent water pressure, you should be able to get between 2.3 and 2.8 gallons per minute. The disadvantage of using your battery powered sprinkler timers is that they can only be used with two circuits. This is because the control lines are contained within the timer itself. If you have above 2.5 gallons per minute or higher, you should have no trouble putting two large sprinkler heads on each circuit. Most of the time, two circuits are enough to cover your entire lawn. Two circuits should be enough to cover up to 3,000 ft.² of back lawn. If you want to save time digging, use a narrow trench digging shovel. For my project I used the half-inch poly tubing. Make sure that the piping is at least 6 inches below the ground. Make sure to flush the system before putting your heads on the end of it. This will ensure that there isn't any dirt in your lines that can clog them up. Make sure to test your system for filling in all of the dirt. Installing a sprinkler system is a great way to help you conserve water. It will ensure that you do not leave your water on for hours at a time. 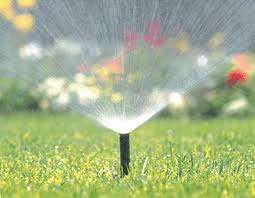 Another tip to help you save water is to aerate your lawn at the start of the spring. When you aerate lawn, you encourage your roots to grow deeper. Also, whenever you water your lawn, the water will soak in deeper. Spencer Arnold is an expert landscaper. He has had 10 years of experience in preparing lawns. His hobbies include raised garden beds, and do-it-yourself home repair. He can provide excellent answers to garden and lawn questions.